﻿ The Champions League challenge: There can be only one! 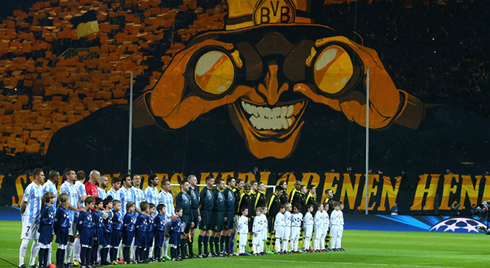 11.04.2013 » The Champions League challenge: There can be only one! In typical fashion, the Champions League quarter finals once again did not lack excitement. Points were proven as top-level football was played over the course of four days within the last week. Through eight matches played, in just over 720 minutes of pitch time we were able to witness 23 goals. That averages out to a goal every 31 minutes. Not bad, considering the level of play we're witnessing at the quarter final Champions League level. Surprisingly, the only team that managed not to score is Juventus. The Italian giants have a threatening frontline and midfield that managed to create 61 goals so far this season, but their tactics were powerless against the clearly hungry Bayern Munich. Juventus conceded the first goal of the quarter finals to an unlikely candidate, Bayern's left-back David Alaba, who managed to find the net from quite a distance inside the first 30 seconds of play. Although Alaba's opening strike owes a little gratitude to the gods of deflection, it was brilliantly placed and reinforced the confidence Bayern would tirelessly maintain to knock Juventus out of the UEFA Champions League, with a dominant 4-0 on aggregate. Before the matches began last week on Tuesday, most football fans had expectations that Bayern Munich vs Juventus would be the most hard-fought draw, but in the end, it was the most one-sided. Twenty-four year old Polish striker Lewandowski stepped up for his team and netted their equalizer just five minutes before half time. All eyes were on Dortmund after the second half started to score the much-needed second goal, but it was the unlikely Malaga who would again shake the net in the 82nd minute. Portuguese winger/left-back Eliseu dos Santos was subbed on in the 74th minute for Malaga and scored 8 minutes later, seemingly sealing the deal for Malaga to advance, while also, combined with Alaba's goal for Bayern, proving that left-backs can be just as important as any other players on the pitch. Malaga earned their position in the quarter finals of the Champions League for sure, but it was Dortmund who eventually triumphed thanks to their hard work and tireless work ethic. The poor-performing but ultimately unbiased referees called for stoppage time, and seemingly woke Dortmund up in the process. The Germans responded with 2 goals within 2 minutes, one from the reliable young Reus and then another from Santana. Malaga exited clearly buried in disappointment and frustration, but having provided a much more thrilling tie to the fans than many had hoped for. Malaga weren’t the only ones to bring false hope to their fans. Paris Saint-Germain seemed to have an equally difficult task ahead of them when they drew Barcelona. But with Ibrahimovic's 2-game suspension lifted prior to the first match, all bets were off. With his stature and goal-scoring capabilities, not to mention his debt to settle against Barcelona, Ibrahimovic was the Blaugrana's biggest worry. With Ibrahimovic backed by former Real Madrid star David Beckham and two other former Barcelona players, Maxwell and Motta, it was anyone's game. A nervy 90 minutes ended with a 2-2 draw. Messi opened the scoring just before half time, after receiving a superb overhead ball from Dani Alves inside the box. Messi over-extended himself later on though, and requested a substitution for a hamstring problem. A Messi-less Barcelona held PSG off for a while, but Ibra got his long sought after equalizing against his former club, as the game was drawing to a close. While it looked liked the pitch had decided on a 1-1 draw, a penalty kick was awarded in the 89th minute to Barcelona. With Messi sidelined, Xavi stepped up and netted what looked to be a sure winner. Then stoppage time gave PSG the courage to respond with a goal from midfielder Matuidi, to bring them level again before the second leg. Thankfully for Barcelona fans, the second leg was at home. 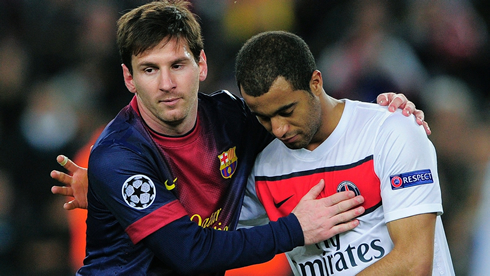 But with Messi in limbo and Mascherano also injured from the first leg, doubts about their ability began to surface. With a makeshift backline they were able to hold off an equally aggressive PSG, who created several chances after a shaky settling in at the Camp Nou, during the first ten minutes or so. Messi watched nervously from the bench as his team repeatedly gave up possession and Victor Valdés was called upon to save his team. When Argentinean footballer Javier Pastore scored the opening goal for PSG, just five minutes into the second half, a goal that single-handedly would have given them the win on aggregate, Messi immediately began warming up. Despite concern that playing so soon following an injury would worsen his condition, Messi was brought on for the inneffective Fabregas, around the 62nd minute. To anyone watching, Messi's presence clearly brought Barcelona's focus back up as they were immediately restored to the dominant side. It only took eight minutes on the pitch for the little man to create the equalizer, and ultimately the goal that would send Barcelona through to the semi-finals, the draw for which will be on Friday. After dribbling through some defenders, Messi connected the ball to his partner-in-crime David Villa, but Villa was surrounded in the box with no clear shot so he sent it a few yards behind himself to Pedro, who had been having a poor game. But the Spanish forward found his form at an incredible moment as he sent Villa's backpass strongly into the net. Barcelona move through on a 3-3 aggregate over PSG, because of the 2 away goals they were able to get in Paris. And if all that wasn’t enough action, Real Madrid almost lost their 3-0 first leg lead over Galatasaray. Gala's big threat was their late-window purchase of Dutch midfielder Wesley Sneijder and Ivory Coast striker Didier Drogba, both of whom have led their previous teams, Inter Milan and Chelsea respectively, to dramatic Champions League wins. But Real Madrid were uniformly confident and focused at home in the Bernabéu. The first leg saw a resurgence of the Merengues front line, as Ronaldo, Benzema and Higuaín all scored in succession. It only took Ronaldo 9 minutes to score the opener with one of his routinely superb goals from an Ozil assist, and with that he scored the goal that would keep him in his position as lead scorer for the Champions League. Higuaín was able to head his very first goal of the Champions League campaign from a beautiful free kick courtesy of Xabi Alonso. Diego Lopez kept his sheet clean by maintaining the fine form he's been enjoying since his transfer to Madrid. There was little hope for Galatasaray after their 3-0 defeat, but when Madrid traveled to Turkey, they proved themselves to be very determined opponents. After Ronaldo scored even more quickly, just seven minutes in this time around from a tight and powerful Khedira cross, the second leg appeared to be already over. It took until the 2nd half for Gala to respond, first with a strong goal from Eboué, then another from Sneijder, who got his first goal of the Champions League this season. At 2-1 for Gala, Real Madrid were still overly confident that they could win, and 2 minutes after Sneijder's goal, Galatasaray's other star purchase, Drogba, also got his first goal in this Champions League's edition. But with the aggregate scoreline so tight, José Mourinho's men adjusted their tempermant and held off any upset. Just to prove who was running the game, Cristiano Ronaldo sent a final strike into the net, nailing Galatasarays's coffin shut. His second goal of the match and third of the tie, puts Ronaldo in a commanding lead for top Champions League goal-scorer. He sits three goals above Leo Messi and Gala's now ousted Burak Yilmaz. With the German league completely closed and the Spanish League getting closer, all four qualifying teams – Borussia Dortmund, Bayern Munich, Barcelona, Real Madrid – will have complete focus for the Champions League. And as we’ve seen from the quarter finals, when these teams focus, it means trouble for their opponents... However, at the end it will come down to who proves capable of lifting the trophy and as everyone knows, "there can be only one"! 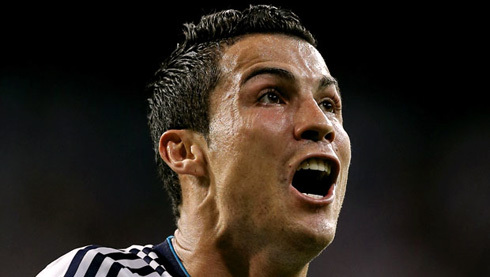 Cristiano Ronaldo next game for Real Madrid will be an away fixture, against Athletic Bilbao, on April 14, 2013, for the Spanish League. You can watch Juventus live stream, Athletic Bilbao vs Real Madrid, Zaragoza vs Barcelona, Reading vs Liverpool and Arsenal vs Norwich, all matches provided from our soccer live section.